What did “one if by land, two if by sea” mean? It’s one of those phrases, like “Damn the torpedoes!” or “Give me liberty or give me death!”, that all Americans know, but not everyone is sure they can explain. It’s a quick story but a good one. In May 1774, the governor of Massachusetts, Thomas Gage, dissolved the General Court. This was Massachusetts’ popularly elected legislature, and had been since the Massachusetts Bay Colony was founded in 1630. The General Court was to be replaced by a Council of men appointed by King George III, just as Governor Gage had been royally appointed. This move overturned the system established in 1691 when Massachusetts became a royal colony: a royally appointed governor, but a popularly elected legislature. So the Provincial Congress was in Concord, led by John Hancock, and a network of secret spy posts quickly went up between Boston and Concord. These were organized and manned by the Sons of Liberty’s Committee of Safety, which had one very active member named Paul Revere. The northwest precinct of Cambridge, a village called Menotomy (today’s Arlington) was just about at the halfway mark, and the Committee of Safety established a post at the White Horse tavern there. The posts were meant to send news from Boston to Concord about British plans and troop movements. When the patriots in Boston found out from their spies that the British were planning to go out to Concord to seize an arms and ammunition cache, then arrest the members of the PC, Paul Revere, William Dawes, Samuel Prescott, and a few men whose names are lost to history made ready to ride out to Concord along the spy road to warn the town and the Congress. Word came that the British would set out from Boston on the night of April 18th. Now all they needed to know was what route the soldiers would take out to Concord. The “land” route is in green. The green line that begins in Boston actually covers up the thin, long neck of land that connected the city to the mainland, but there was a land line, and if the British went south, that would be going “by land”. This was a longer, more roundabout way to Concord, but it avoided the difficulties of the sea route. The “sea” route is in blue. The little blue boat covers up the Charles River that lay between Boston and Charlestown. Taking this route, the British got to Concord a little sooner, but also got very wet embarking and disembarking and then marching through swamp land on the shore. Dawes actually took off first, before Revere, going by way of the land route just before the British sealed off the city. Revere snuck across the Charles River to Charlestown, illegally crossing the river at night, to warn the citizens that the British might be coming through at any moment. 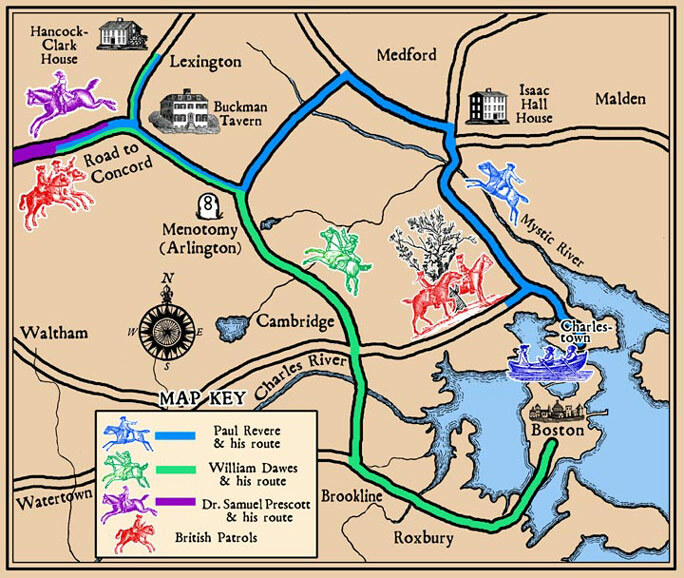 Revere and the citizens of Charlestown whom he had alarmed then waited for a signal from Robert Newman, sexton of the Old North Church in Boston, about whether the British were indeed on their way, or taking the southern route. The rest is history. The British completed their sea route to Concord, and a famous standoff ensued—more on that another time. For now, “one if by land, two if by sea” is fully explained for all, and makes a satisfying addition to our store of knowledge on our country’s founding.